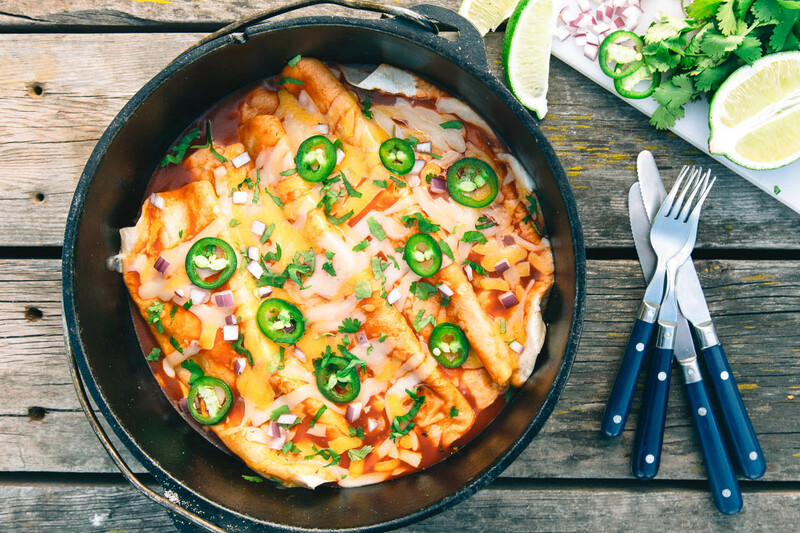 Cheesy, spicy, and oh so filling – these veggie-stuffed Dutch Oven enchiladas are one of our new campfire favorites. But never fear, a cast iron Dutch oven is all you need! When it comes to campfire Dutch oven recipes, enchiladas is one of the easiest places to start. The reason being: there’s not a whole lot of actual cooking going on. Sure, you are warming ingredients and melting cheese, but that’s all super forgiving stuff. 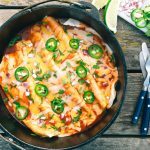 So if you’re new to Dutch oven cooking or thinking about getting into it, kick things off with enchiladas! Now making enchiladas is a pretty straightforward process, but we have a few tips that can make a real difference. Frontero – Comes in a pouch, so it compacts down in the trash after you’re done using it. Trader Joe’s – Comes in a glass bottle which may not be ideal for camping unless you repackage it, but it has a great taste. 3.) Toppings! 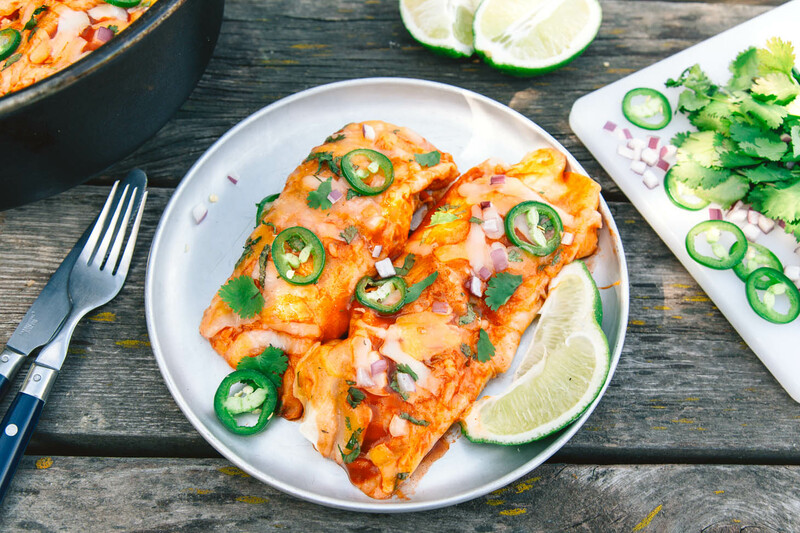 Cilantro, diced red onion, a spritz of lime juice, cotija cheese, or sliced jalapenos are all excellent ways to take your enchiladas to the next level. So for your next camping trip, pack along the Dutch oven and take Enchilada Night into to great outdoors. 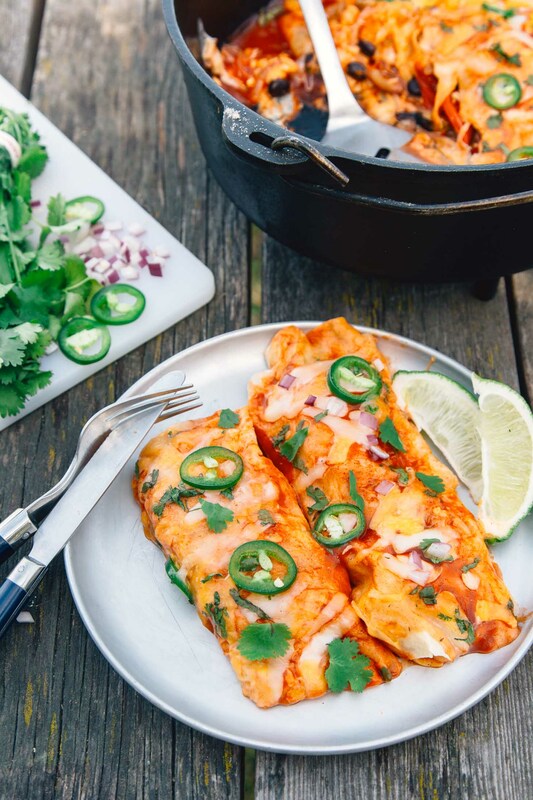 These Dutch Oven Enchiladas are such an easy camping meal! Stuffed with veggies, covered in sauce, and topped with melted cheese, this recipe is one that everyone will enjoy. Prepare your coals or get your campfire going so that you'll have embers to cook with. Over medium heat, heat the oil in a Dutch oven. Add the peppers and saute for a few minutes until they are starting to soften. Add the onions and saute until the onions are soft and translucent and the peppers are soft. Add the garlic, cumin, and salt, and saute 30 seconds, until fragrant. Remove from heat and transfer the vegetables to a plate or bowl. Add 1/2 cup enchilada sauce to coat the bottom of the Dutch oven. To build the enchiladas, place onions and peppers in a line the center of a flour tortilla. Add a few spoonfuls of black beans and top with cheese. Roll the tortilla around the fillings, then place the enchilada, seam side down, into the Dutch oven. Repeat with the remaining ingredients. 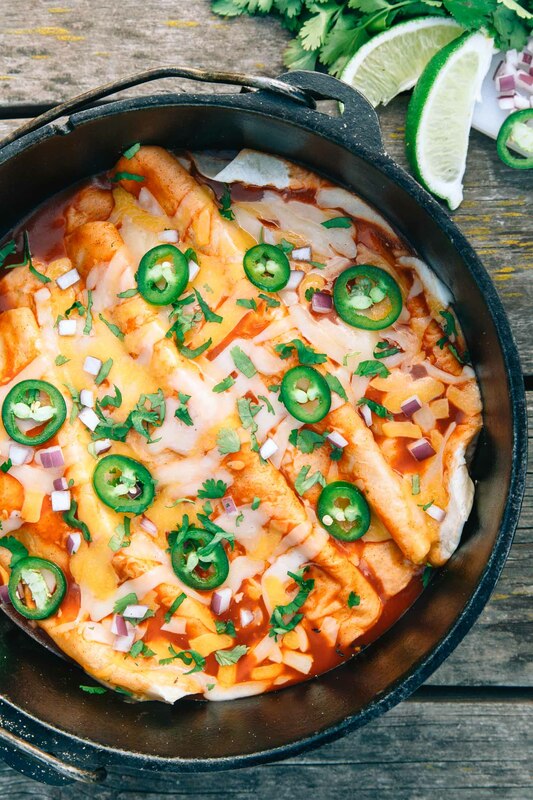 This recipe will make 4-6 enchiladas depending on the size of your Dutch oven. Cover the enchiladas with the remaining sauce and cheese. Place the lid on top. Return the Dutch oven to your campfire. Place it over indirect heat (the grill grate over the campfire works great) and stack 14-16 coals on the lid. Cook about 10 minutes, until the cheese is melted. Serve topped with jalapenos, cilantro, and a squeeze of lime & enjoy! The filling can be made at home ahead of time and packed in your cooler. At camp, start with step 3. Loving your website!! Getting ready for an epic Oregon Coast and Redwood NP adventure while trying to get my family to eat better and create healthier camping habits……..